We’ve previewed Agents of Mayhem a couple of times before, and each time it doesn’t quite feel like we get the full breadth of the experience. That’s not a negative towards Agents, quite the opposite actually. Agents of Mayhem can’t be summed up in a quick demo. E3 2017 gave me the opportunity to play for an hour and I still didn’t have a chance to play all of the heroes or explore the depth of the various abilities. There’s quite a bit underneath the facade of this hero shooter meets over-the-top open world adventure. It’s a delightful romp inspired by the absurdity of early ’90s Saturday morning cartoons and comics. I got a chance to dive into some of the gorgeous cinematics that mimic that style of animation, seeing the origin stories of some of the characters. Some retain a serious tone while relishing in the exaggerated violence, and others star an angry soccer player pissed off that evil doers are ruining his favorite game with his mates. It seems to be a nice balance, especially where Saints Row went for the 120% goofy vibe. Agents of Mayhem keeps that outrageous insanity of the moment, but more selectively doles it out in a variety of forms. The Saints Row roots are readily apparent, but Agents of Mayhem is a wholly different game. Don’t think this is just a rehash of what we’ve played before. There are 12 selectable heroes (plus two additional heroes if you pre-order) that all have different weapons and abilities. Three can be selected at any one time, and you can swap between these three heroes on the fly, creating interesting combos and gameplay strategies across each of their skill sets. On top of the number of heroes, each one has a variety of gadgets and skill upgrades that will further modify the play style and create unique and interesting combinations across all of them. With this only being a single-player experience, there’s not as big of a need to create perfect balancing between the team combinations and the development team is excited to see what kind of powerful mergers players can make. The third-person shooting is familiar but has a lot more of an interesting tack than Saints Row does. 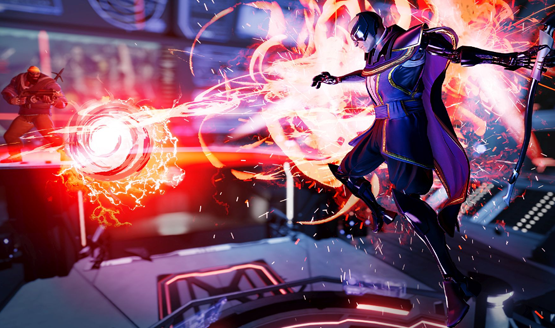 Saints Row was a blast of a power fantasy, but Agents of Mayhem adds a bit more in the way of skill and intrigue to the combat through character depth and the ability to change between your three heroes and their various abilities. With this only being a single-player experience, there’s not a big need to create perfect balancing between the hero combinations, and the development team is excited to see what kind of powerful mergers players can make. Certain missions will force you to use certain heroes, so even if you do find that all-star group, you might have to break up the band on occasion. My mission was to find a Justin Bieber wannabe named Gaunt (or maybe Justin Bieber actually wants to be him). I was able to get a good feel for the kind of variety that Agents of Mayhem has, from exploring the open world to investigating objects, and of course combat. 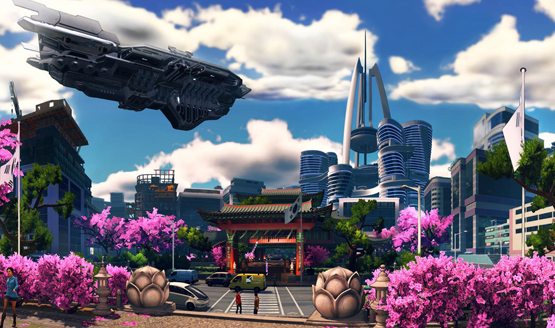 Hints were thrown out about the hilarious satirical spectacle that Agents of Mayhem promises to deliver, and I wouldn’t expect anything less from the team that has given us the Saints Row series. Even an hour didn’t give me enough time to really dive into it. I got a small taste of everything as Senior Designer Ryan McCabe ran me through the gauntlet. The home base, NPCs, story missions, character upgrades and gear, the different heroes, cinematics, character specific missions, vehicles, and open world events. It was a rush of information and quick gameplay in a short period, a lot of fun to play, but something that will really translate better to home release, when players can devote more time to playing with each of the characters and exploring the wide variety that Mayhem has to offer. Agents of Mayhem releases on August 15 for the PS4, Xbox One, and PC. Check out more of our E3 2017 coverage.